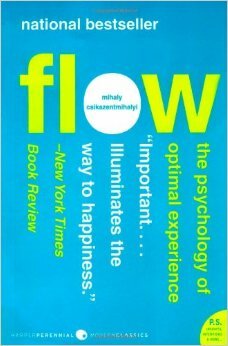 Mihaly Csikszentmihalyi, the author of Flow, is sorta like the Godfather of positive psychology … Hailed by researchers and positive psychologists from every corner of the globe — “Mr. C” as I’m sure he’s known as in many circles — has redefined the way we approach “a life worth living” in the modern world. Csikszentmihalyi’s calls these meaningful moments that make life worth living, moments of “optimal experience,” also known as the “Flow” state. And through various case studies, Csikszentmihalyi delves deeply into how we can achieve “Flow” in our personal and professional lives in order to lead happier, more meaningful lives. “Flow” is much more than just a practical guide for leaders — it’s essential. Rather than being idle, doing what you love is a pathway to greater meaning, happiness, and a self of higher complexity. Csikszentmihalyi says that it is best to think about the universe in terms of order and chaos (entropy). That healthy human beings ﬁnd order pleasing is a clue to its intrinsic value, and to its role in the creation of happiness. The bringing of order to consciousness, “control of the mind,” is therefore the key to happiness. However, what gives us this control? Happiness revisited: When are people most happy? The anatomy of consciousness: How Flow brings order to everything. Enjoyment + quality of life: The elements that dictate the triggers of joy and pleasure. The conditions of flow: The eight steps to “Flow”, and how to bring it about for yourself. The flow of thought: Lifelong learning, consciousness, science, and mastery. Work as flow: Bring about full engagement—for yourself and those you lead. The making of meaning: Cultivating purpose + the meaning of meaning. “You know that what you need to do is possible to do, even though difficult, and sense of time disappears. You forget yourself. You feel part of something larger. Csikszentmihalyi’s research began not by looking at the nature of happiness per se, but by asking the question: “When are people most happy?” That is, what exactly are we doing when we feel enjoyment or fulﬁllment? Finding this out included buzzing people on a pager at random points through a week. They were required to write down exactly what they were doing and the feelings that the activity produced. The discovery was that the best moments did not happen by chance, according to the whim of external events, but could reasonably be predicted to occur when a speciﬁc activity was undertaken. The activities described as being of highest value, which when undertaken banished worry or thoughts of other things, were dubbed “optimal experiences,” or simply “ﬂow.”People in a state of ﬂow feel that they are engaged in a creative unfolding of something larger; athletes call it “being in the zone,” mystics have described it as “ecstasy,” and artists term it “rapture.” You and I may recognize our ﬂow experiences as simply those that seem to make time stand still.You stop thinking and just do. Rather than being idle, doing what you love is a pathway to greater meaning, happiness, and a self of higher complexity.Csikszentmihalyi says that it is best to think about the universe in terms of order and chaos (entropy). That healthy human beings ﬁnd order pleasing is a clue to its intrinsic value, and to its role in the creation of happiness. One of the key distinctions the author makes is between enjoyment and pleasure. While challenging tasks that require all our attention are enjoyed, mere pleasure does not have to engage us—it is passive. Television, drugs, and sleep can all be pleasurable, but involve little conscious will and therefore do not really assist our growth. The lesson of optimal experience is that we are genuinely happy when we are in control. Optimal experience is that which is directed by us and gives us a sense of mastery. This is why goals are so enjoyable to pursue: They bring “order in awareness,” irrespective of the feeling one may get in seeing a goal actually achieved. An ordered mind itself is a source of happiness. There are eight major components to Flow. Most people report at least one and often all of the following eight components with regard to being in a state of flow… As you read them, think about something that you love doing in your own life. And if you hate your life, then picture an athlete “in the zone” and see if you can relate. Confront tasks we have a chance at completing. Confidence arises. You stop caring what everyone else thinks about you. And paradoxically, your personal self-worth tends to come back stronger after the flow experience is complete. You completely lose track of time. So, now that you know the stages of flow, how can you bring it about in your own life to enhance or spur your levels of personal + professional fulfillment? Flow makes you feel more alive, certainly, but it has another, perhaps surprising effect: The growth in complexity entails both awareness of your uniqueness simultaneously with renewed understanding of how you ﬁt into your world and your relationships with other people. Flow reconnects you to the world as well as making you more unique. This double effect has tremendous implications for the rejuvenation of communities and nations. The author suggests that the most successful nations and societies of the twenty-ﬁrst century will be those that make sure people have the maximum opportunities to be involved in ﬂow-inducing activity.…Hmm, take a wild guess why Gallup’s 2013 poll called the “State of The American Workplace” tells us that 70% of workers are unfulfilled. He refers to the inclusion of “the pursuit of happiness” in the American Declaration of Independence, a far-sighted aspiration that unfortunately metamorphosed into an expectation that it is government’s role to provide happiness. Whereas goal seeking is a major part of contemporary western culture, a ﬂow focused culture would re-introduce an “in the moment” way of life… Best-selling books like the Power of Now, by Eckhart Tolle, are reviving the necessity of “just being”. And I think it’s really important.With increasing prosperity, if more of the population is engaged in doing what they love, the whole attitude to time would change. Time would cease to be framed by the work patterns of an industrial culture, with its sharp divisions between “work” and “leisure.” Instead, time would be determined by individuals’ subjective attitude to the activity in which they are engaged, that is, whether the activity is ﬂow inducing or not. It’s said that contemporary western and particularly American culture is youth obsessed, one consequence being the terrible fear of aging. Yet the pressure of passing time is relieved if you are truly living and enjoying yourself in the moment, in other words, in a state of ﬂow. To avoid meaninglessness, we can either devote our lives to pleasure, which usually ends in ruin or mental entropy, or sit back on autopilot and try not to think about all our possible choices in life. This last possibility amounts to a surrender to whatever happen to be the societal values of the day, letting ourselves be deﬁned more as a consumer than as a person. Csikszentmihalyi ﬁnds Freud to be particularly relevant here. Freud’s “id” was a representation of the instinctual drives of the body, while his “superego” represented the external world to which our sense of self may be shaped. Freud’s third element in consciousness, the ego, is that part of ourselves that has managed to gain an autonomous sense of self in spite of our bodily urges or environment. It is here, leaving behind the animal and the robot, where humanity is to be found. A person living within this consciousness is doing so by will, and since the universe never makes things easy for us, this person must become increasingly complex (not in terms of confusion but higher order — sort of like solving a huge issue, or finally closing a huge deal with a client that was very difficult to work with). Csikszentmihalyi’s research established a fascinating point about the ﬂow experience: After each instance, a person is more than the person they were before. Each piece of knowledge absorbed, each new reﬁnement of a skill, enlarges the self and makes it more highly ordered, forming, in his words, “an increasingly extraordinary individual.” This is why opportunities to create ﬂow can be addictive—life without them feels static, boring, and meaningless. Happiness and a sense of meaning can therefore be increased, the author says, simply by doing more of what we love doing. The question of “the meaning of life” may not be answered in its most esoteric sense (that is, why does anything exist), but can be answered at a subjective, personal level: The meaning of life is whatever is meaningful to me. The experience of ﬂow does not need an explanation for those who enjoy it; we are simply aware that it gives us the two things vital to happiness: a sense of purpose and self-knowledge. Flow is a peak mental state in which someone becomes deeply involved in something by following a specific set of principles. Again, in order to identify those principles, Csikszentmihalyi conducted a series experiments. By applying enough concentration, having a clear set of goals, and measuring your own results, you can bring about a sense of flow in any activity you’re doing. Even if it’s something that most people would consider boring. For instance, a factory worker counting muffins on an assembly line can bring about a state of flow, simply by trying to beat his own time over and over again. Counting 1,000 muffins on Monday, and 1,100 on Tuesday. Flow requires standardization. It’s process oriented. Sometimes focused more on making the boring bearable than making the enjoyable extraordinary. But no matter who you are and what you’re doing, you’re bound to lose focus every now and then. Learning how to get yourself into an immediate state of flow can be helpful in those times. Every single, living, breathing, person on this planet, if mentally and emotionally stable, will seek to find their place in the bigger picture of life. People are purpose-driven by nature. When we lack this sense of purpose, some of us go crazy trying to find it. As leaders, we play a critical role in the lives of many more people in addition to our friends and family — we have a teams, businesses, or nonprofits that thrive or dive depending on our leadership. We’ve all seen or heard about organizations that seem to lose their personality after the passionate founder that built it up stops hanging around the office or retires. The solution here, is to define the values of your organization, make em’ simple, and align with them. In other words: talk the talk + walk the walk. When your people see that you’re not the type of leader that thrives on hypocrisy, they’ll value your integrity, and in turn, begin to truly feel part of the team. There are also times when a leader that cares deeply about his people, will sacrifice his values to meet the needs of others. The challenge of the conscious leader is to cultivate harmony between his values and the values of those he leads. Flow can’t be forced on anyone, it’s a personal level of extreme immersion. That said, those who can cultivate Flow for themselves, will tend to be happier and more fulfilled. To help others find flow, set up the conditions to do (see The Conditions of Flow) so, by setting up a culture/environment that’s conducive to Flow. Control – allows people to manage themselves vs. get managed by others. Collaboration – allows people to connect with one another. Content – gives people the ability to choose their work. We tend to thrive with clarity. No secret there. But how many things can we be clear about at the same time?Answer: just one thing at a time. Constraints = Liberation. To expound on the power of creating structure/order, think about this: what do FlashNotes and Twitter have in common? Answer: both incorporate constraints. Twitter = say it in 140 characters or less. FlashNotes = read a book in 10 minutes or less. “Disorder” = Bad. The Flow theory implies that a person that brings about order of consciousness is more engaged and productive, as well as happy. Naturally, “disorder” being the opposite of the above, implies that a lack of clarity + structure in life/work results in dis-engagement, lack of enthusiasm, and a general lack of meaning and purpose.Bottom line: too much of anything isn’t good for anyone. None of us can “find” flow, we’ve got to pick something to get up for in the morning and cultivate it into something that brings about the flow state. However, if we end up getting so deeply involved in something that we neglect the other dimensions of life, we’ll fall right out of balance. And so, Flow requires a synergy between seemingly opposite disciplines in life: focus, order and consistency seem to clash with freedom, openness, and that “time-warp” feeling.